BlastIR USB IR repeater kit allows you to use an existing remote control to operate up to four AV components located behind in the rear the room, in a cabinet, an equipment closet, or anywhere else that is out of sight. The BlastIR's IR distribution technology allows you to conceal all of your bulky entertainment equipment, like your cable box, satellite receiver, stereo, amplifier, Blue Ray player, and more without losing the ability to control it with your remote. 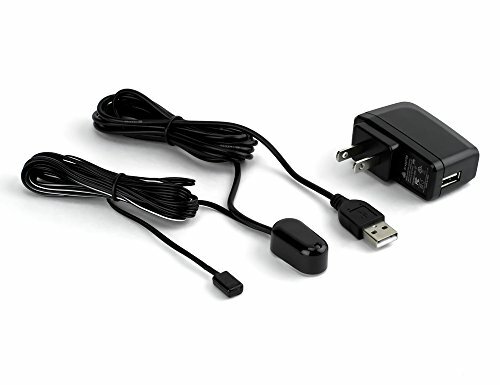 The BlastIR USB repeater kit is dual band, which means it will work with the most IR devices. You can power the BlastIR USB with the USB port on your HDTV, giving you a clean look and an easy install. If your TV doesn't have a USB port, simply use the included DC12V adapter. This compact BlastIR is perfect for a simple installation in which you are only hiding away one device. If you need to control multiple devices, check out the full sized BlastIR. The BlastIR USB consists of an emitter, a receiver, and a USB power cable. The receiver is a small, easy to hide device that you can mount on or near your HDTV. Keep in mind that the receiver must be in the line-of-sight to wherever you will be using your remote control. The receiver picks up your remote's IR signal and transfers it over a small cable to the emitter. The emitter can be placed directly over the IR sensor on the device you wish to control. The USB cable either plugs into the USB port on your TV, or you can plug it into the included DC12V adapter to power the BlastIR USB. If you have any questions about this product by Sewell Direct, contact us by completing and submitting the form below. If you are looking for a specif part number, please include it with your message.